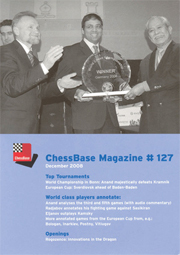 The big story in CBM 127 is the world championship match in Bonn. Vishy Anand has annotated his third and fifth game victories in Fritztrainer format and GM Rogozenco provides more than an hour of in-depth analysis of all the important games in video format. Further Fritztrainer videos can be found in the columns Endgames, Tactics, Opening Trap, and Fritztrainer, while the new products section features select videos from Daniel King and Alexei Shirov. Other regular features include the columns Strategy by Peter Wells, Move by Move by Daniel King, and two correspondence columns with more than 2,000 games. There are also fourteen opening surveys, including Marin on the Ruy Lopez [C90] and Catalan [E05], Langrock on the French Defense [C03], Stohl on the Caro-Kann [B12], Grivas on the Queen’s Indian [E16-19], Ftacnik an the Slav [D11], and many more.